A plane almost fell out of the sky, or so it would seem. Mae had a vision of a falling tire, but as you know, it took her up until yesterday before she realized that that’s what it was. She called us immediately, but we didn’t know what to do. We still didn’t know where the tire was going to fall, or if anyone was destined to be hurt by it. We didn’t know what we could do to help the situation, even if we had all the necessary details. Mae’s drawings have only ever proven true once the future becomes the past, and we realize what it meant all along. This was the first time any of us had any clue what might happen before it actually did. So we finally brought Margaret’s brother in on the full story, and he had an idea. Or rather, it was more like he was the missing piece itself. Viola didn’t specifically tell us that we were meant to keep the prophecy stuff a secret from him, but she didn’t tell him herself, so we kind of inferred. As it turned out, we needed him to sort of—how might I say—complete the circle. Four of us together made our collective psychic connection so much stronger than it ever was when it was just us three girls, or just the twins. Him being totally on board gave us the tools we needed to complete our mission. What we realized was that the tire was bound to fall on top of Masters Country Club, and it was going to do it during a special production from Blast City Senior High’s Magic Club. I guess they were dedicating the show to Viola? The tire itself was as big as you would expect from a heavy airliner, but that didn’t mean it was only going to hurt a few people. First of all, we still didn’t know exactly where it was going to crash, so we couldn’t just keep people away from that area. We also couldn’t stop the plane from taking off in the first place, warning them that they needed to perform extra maintenance, though that would have been the ideal scenario. No, our only hope was to evacuate the building, and our only way to do that, was pull the fire alarm. Well, lots of people saw Martin attempt to do just that, and they also saw him fail. Something was wrong with the electrical system, I guess, and it wouldn’t go off. Even if it had, those witnesses wouldn’t have left, because it just looked like he was trying to pull a prank. Margaret stood up on a table, and tried to warn everyone the old fashioned way, but nobody listened. The tire was going to crash right through the roof so hard that the whole structure could fall down on top of everyone, but they weren’t concerned. It sounded insane, and several people pointed out our story’s similarity to a certain ancient avant-garde indie film about time travel, and creepy bunny masks. I then had this intuition that maybe our combined power was stronger still, and that we were capable of solving this on our own. I directed the other three to each stand on one side of the country club, so that we formed a perimeter around it. Then we formed a deep psychic connection; deeper than we ever had before. We started concentrating on the idea of protecting the club, in whatever way that might work. Though our eyes were closed, we could feel an energy rise from our stomachs, and envelop the building. 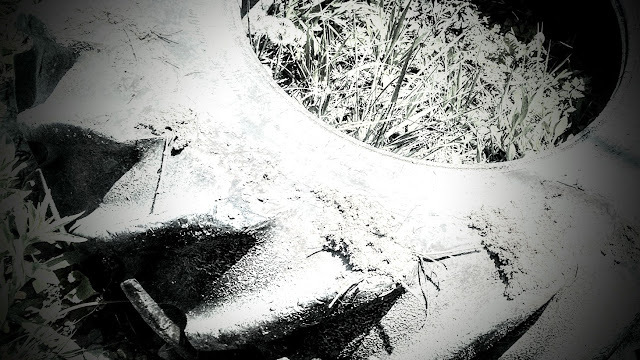 We could also feel the tire, having already broken from its plane, and falling towards the ground. Just before it reached us, the energy bubble was complete. The tire landed on it safely, and once our bubble burst, it continued to fall, until hitting the roof, and rolling off to the ground. All told, the country club building only suffered minor structural damage, and no one was even close to being hurt by it. It’s unclear how many lives we just saved today, or rather, it’s unclear how many lives Viola saved, because she was the one who gave us our abilities, and predicted when we would need them. I had always assumed we would lose them after fulfilling the prophecy, but our bond remains. Who knows what else we might do with it?